TAIPEI, TAIWAN — Thousands of Taiwanese, taking a page from France’s yellow vest movement, protested Thursday for the third time in a week to demand lower taxes and the fair handling of tax disputes. A protester shouts slogans demanding tax reform outside the Ministry of Finance in Taipei, Taiwan, Dec. 27, 2018. A large group of activists has launched anti-government protests to demand tax reform, inspired by the demonstrations in Paris that began last month. 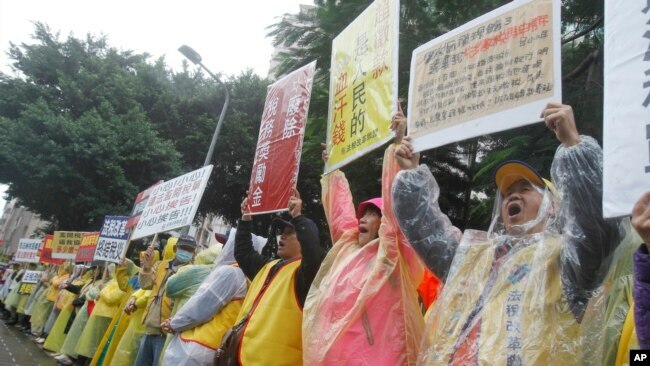 Wearing yellow vests, they shouted slogans and blared air horns outside the Ministry of Finance in Taipei, the capital city, and waved banners calling Taiwan’s tax collection policies illegal. Some wore clear plastic raincoats over their vests in a light rain. “This is about our futures,” said Joanna Tai, a 23-year-old English language graduate student who plans to teach after graduation next year. Taiwan protesters demand tax reform outside of Ministry of Finance in Taipei, Taiwan, Dec. 27, 2018. A large group of activists has launched anti-government protests to demand tax reform, inspired by the demonstrations in Paris that began last month. French President Emmanuel Macron eventually agreed to scrap a tax hike for gasoline and diesel, increase the minimum salary for full-time workers as well as other steps. The average monthly wage in Taiwan is $1,364, and the minimum wage is set to rise to $750 in January. During her campaign, President Tsai Ing-wen said she would work on wages and welfare for young people. KPMG ranked Taiwan 33rd for the world’s highest taxes on a list of 135 countries and regions. France ranked 12th.